The device is mainly used for material concentration during production of liquid milk. The heating period of materials is short and the evaporation temperature is low. It maintains the flavor of fresh milk. It is applicable to the concentration of food, chemical industry, medicine and pharmacology, dairy, beverage, western medicine and starch sugar and recovery of industrial organic solvent (such as alcohol). It can be used in the low temperature vacuum concentration of heat sensitive substances with smaller concentration ratio. Evaporation system uses the method of falling film evaporation. the evaporation system can be made up of single-effect,2-effect,3-effect,4-effect,5-effect,6-effect according to the property of compressed material and customer's request. It can be also used together with the coercive circulation evaporator and crystallizer to deal with the concentration and product crystallization of high viscous and easy scaled material. It is characterized by high efficiency of heat conduction, low power consumption etc. It can widely use the waster heat (such as the drier's hot air and flue gas), the remaining heat (of condensing water, process water and flash steam) to form a waste heat evaporation machine unit. (1) Low evaporation consumption, 1Kg steam can evaporate 3.5Kg water. (2) Low evaporation temperature. Part of twice steam can be inhaled into single-effect heater through spray type hot pressure pump. The high quality evaporation can be fully used and the evaporation temperature is low. (3) Large concentration ratio with downward film type evaporation, which can make material liquid with viscosity be so easy to flow and evaporate, Hard to agglomerate with short concentration time. The concentration ratio can reach 1:5. (4) The equipment can realize automatic production, intellectual system, which is conformity with GMP standard. 1.Packaging: one system machinery could be packed in the container, instrument packed in wooden case. Usually 20ft,40OT,40HQ. 2.Shipping: Usually shipped by sea, also accept by air or by car. 2. 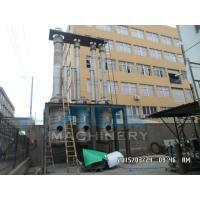 We have 70 various processing machine. 3. Our chemical engineers, machinery engineers, electrical engineers, piping engineers... can specialized suggestions to you and are available for oversea service. It's applicable for dairy products, beverage,pharmacy, glucose, starch,chemical industry, xylose, citric acid, ammonium sulfate, biological engineering, environmental engineering and waste liquid recovery and treatement. etc. It consists of (first-effect, second-effect, third-effect) separators and evaporators and preheaters,condenser and vaccum pump, feeding pump,circulation pump, discharge pump, condensed water pump and system pipe fittings, etc. Equiped wit CIP spraying cleaning ball, vacuum gauge, thermometer,pressure gauge,and so on. 5.Low evaporation temperature:part of secondary steam can be inhaled into single-effect heater through spray type hot pressure pump, this would make full use of the heat and the evaporation temperature is low. 6.Large concentration ratio: adopt falling film evaporation, which make the material liquid with larger viscosity be easy to flow and evaporate, hard to scale, short cocentration time, the concentration ratio can reach to 1:5. 7.This equipment can realize automatic production, intellectual system management, which is in conformity with GMP standard. 8.Can be desinged into different technological process according to the different characteristics of the materials , also can according to different users' requirements equip with automaticl control system.